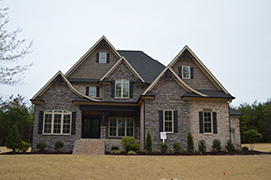 With all of the details that go into homebuilding for custom homes in Greensboro NC, it is important to have a pre-construction meeting to make sure that everyone is informed of the schedule, costs and materials. The more knowledge you have as a homeowner going into the building phase, the better prepared you will be for each step of the process. R&K Custom Home Builders requires that a pre-construction meeting take place to make sure that we are meeting and exceeding expectations. We will review the construction and selection schedule, as well as the change orders and allowance summary. What are some of the benefits of having a pre-construction meeting with a homebuilder in Greensboro? There will be decision making points along the way when building a custom home in Greensboro, NC, and by sharing and reviewing all of the information up front; everyone will be better prepared to contribute throughout the process. Bring your creative ideas, thoughts and vision of your new custom home and meet to go over how each detail can be accomplished. R & K Custom Home Builders will discuss all of your available options, go over a detailed schedule and make sure that expectations are being met. We look forward to working together to build your new dream home. Contact us today at 336-643-3503 to begin working on the home design for your custom home.